InnoMedia was founded in 1995 by two noted pioneers in the fields of multimedia and telecommunications, with the vision of delivering INNOvative multi MEDIA solutions. 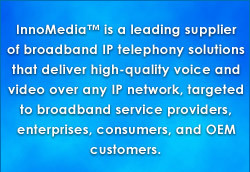 Today, InnoMedia is taking advantage of delivering the convergence of voice, data and other media over a unified broadband IP network. Taking this vision from inspiration to the design and delivery of IP requires the talent, dedication and focus of many people. InnoMedia has assembled a bright and creative management team from telecommunications, technology and consumer product industries to lead the company. The team brings experience from management positions at Creative Technology, AT&T Bell Labs, Teknekron Communications Systems, Digicom Systems, Pacific Telesis, Nuera Communications, Rockwell International, and Siemens.